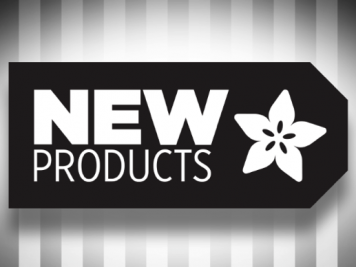 NEW PRODUCTS – Bluefruit LE Friend – Bluetooth Low Energy (BLE 4.0) – nRF51822 – v1.0 / Bluefruit LE Sniffer – Bluetooth Low Energy (BLE 4.0) – nRF51822 – v1.0 « Adafruit Industries – Makers, hackers, artists, designers and engineers! 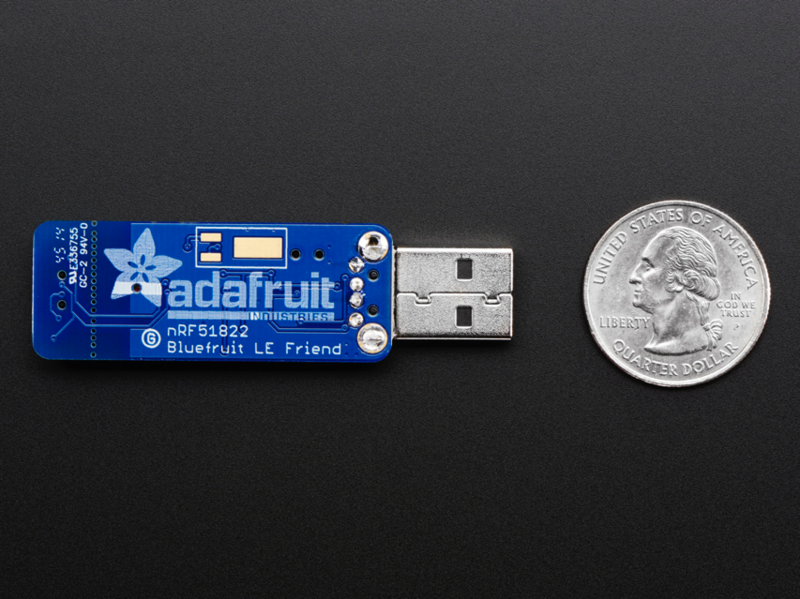 The Bluefruit LE Friend is your new BLE BFF! 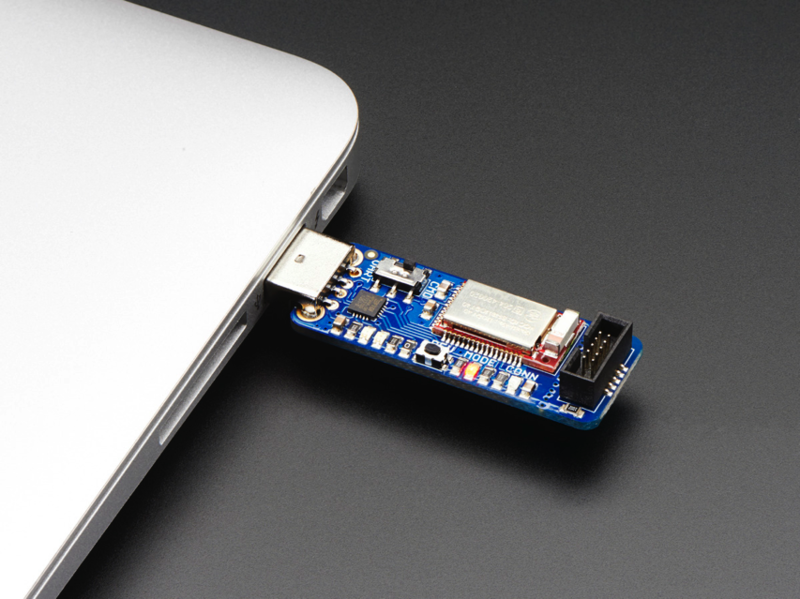 This USB-to-BLE board makes it easy to get your computer talking to your BLE enabled phone or tablet using a standard serial/UART connection. In it’s simplest form, it works on the same principle as a common USB/Serial adapter (the FTDI Friend, for example!). Any data that you enter via your favorite terminal emulator on your development machine will be transferred over the air to the connected phone or tablet, and vice versa, as a basic ‘UART’ connection. Works great with both Nordic (Android/iOS) or Adafruit (iOS) UART app, check out our source code if you want to create your own app! Optional Command mode to set GATT services/characteristics, advertising name/packet, Beacon capability, query status, RSSI, etc. You might be asking, Hey my macbook already has Bluetooth and I can get a USB Bluetooth adapter, so why use this? Good question! You can get a Bluetooth 4.0 USB dongle from the store already, but Windows 7 doesn’t support Bluetooth Low Energy natively, and on Win8 or OS X you’ll have to sort through a huge pile of native Bluetooth APIs and development tools that often require an annual paid license and specific license terms to access. You can’t just connect wirelessly without a huge stack of software or firmware in the way because there isn’t a standard, open source, cross-platform way to talk BLE today. 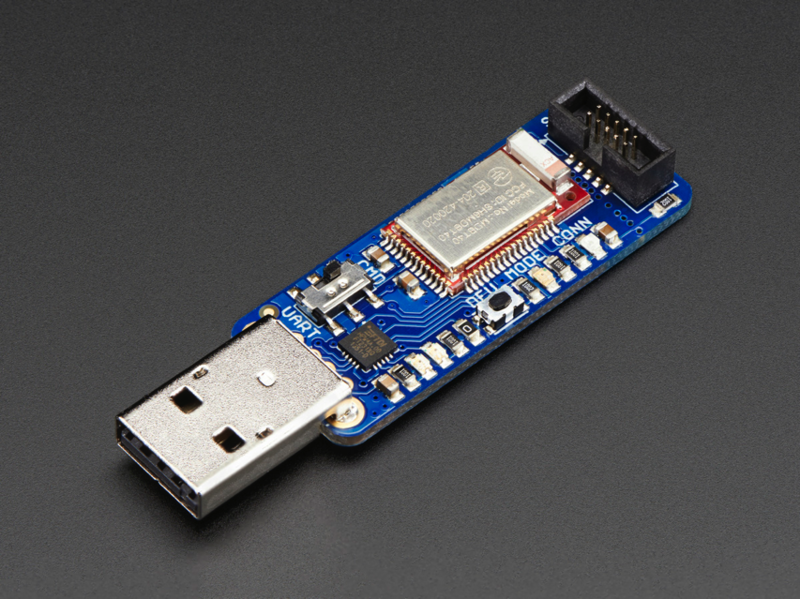 The Bluefruit Friend is much more, it has a full BLE peripheral stack and interface software so that you can treat your BLE connection just like a UART connection – that makes it trivial to use with free Terminal software or scripting software like python (with pySerial). Using Bluefruit LE Friend, you can be up and running in under and hour on just about anything with a USB port, with easy migration across platforms and operating systems. To use, simply plug into your computer and flip the switch to either UART mode (transparent data transfer, anything you type will be sent, and data from phone is received as well) or CoMmanD mode, where thanks to an easy to learn AT command set, you can also create your own basic GATT Services and Characteristics, simulate Beacons, and change the way that the device name appears/advertises itself. To make sure that your device stays up to date and can benefit from the latest Bluefruit LE firmware from Adafruit, you can also update the firmware on your BLEFriend over the air using any BLE-supported iOS or Android device. We always try to keep the bar as high as possible at Adafruit, and one of the biggest advantages of the BLEFriend and the entire Bluefruit LE family is that we wrote and maintain all of the firmware running on the devices ourelves from scratch and we’ll be releasing new firmware and bug fixes without having to rely on a third-party vendor. 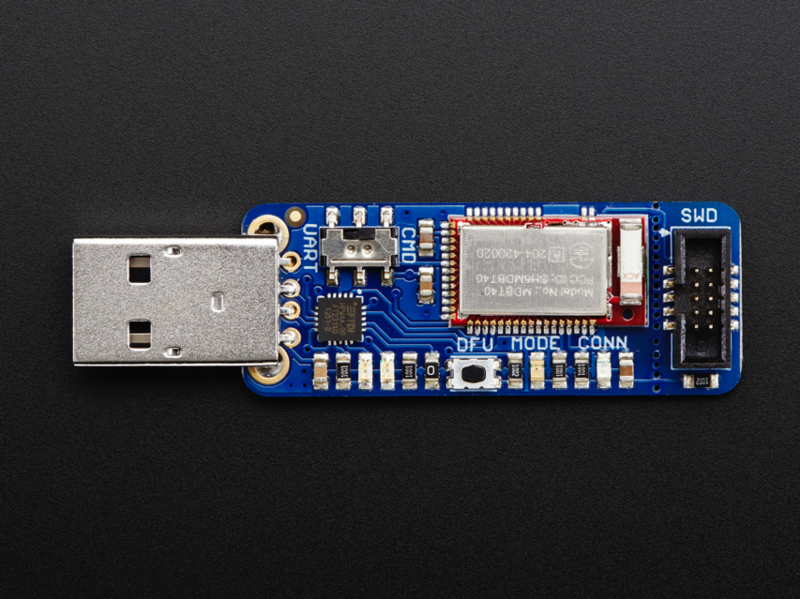 For super-advanced users, we have an SWD connector on board that can be used to reprogram the nrf51822 using Nordic’s SDK and an SWD debugger like the J-Link. 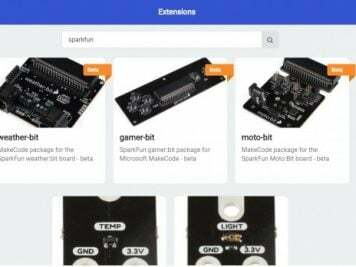 We have a huge tutorial with all the details over at the Adafruit Learning System! 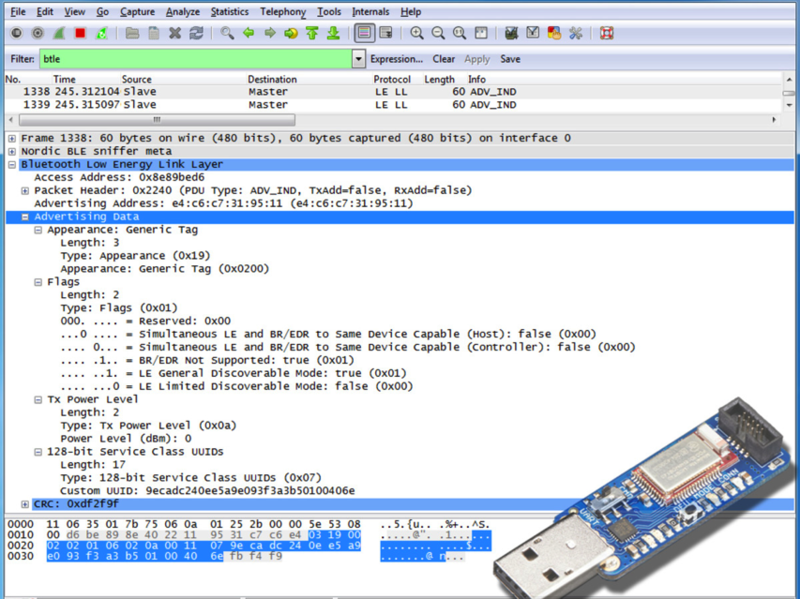 Interested in learning how Bluetooth Low Energy works down to the packet level? Debugging your own BLE hardware, and trying to spot where something is going wrong? 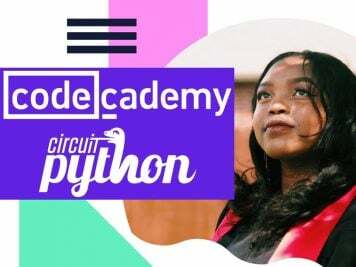 Or maybe you’re writing a custom application for your phone or tablet that needs to talk to existing BLE hardware, but you don’t know how it works beneath the surface? 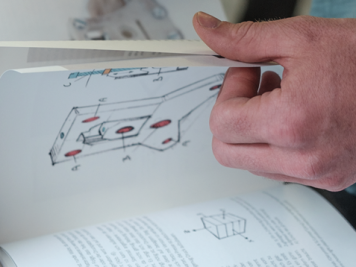 We have the perfect tool for you! Plug it into your development machine, fire up the special sniffer bridge SW, select the device you want to sniff, and it will fire up Wireshark for you and start pushing data in via a live stream. Please Note: The sniffer software is currently Windows only. We’re exploring ways to make this tool accessible on other platforms, but for the moment you’ll need a Windows-based PC to use the device.